The Galapagos Islands are within the Nazca plate, one of the many tectonic plates that form the earth, the same underwater volcanoes that form the same ridges that form the highest peaks where they break the ocean surface and became in the several islands that make up this archipelago. This natural diversity makes the submarine level in a resource-rich in species and habitats that are exposed to ocean currents that circulate here. These unique resources have given the Islands an unprecedented relevance. Its marine biodiversity and water sustains life in both the ocean and on land. The attractions that we see in national parks visits come directly from the sea. The sea birds, for example, lay their eggs and rest on land, but feed at sea. The same activity is applied in sea lions, marine iguanas, and even plants in coastal areas that depend on healthy marine environment. It was important to include the marine ecosystem management level within their protected areas in Ecuador. In 1986 he pled to this resource as a protected area, and became a Marine Reserve in 1998 was declared by UNESCO as Natural Heritage of Humanity. The Galapagos is considered reserve as one of the biggest in the world with an area of 138,000 km2 of the Pacific Ocean and 40 miles calculated peripheral geographic points of the islands. Today is the second largest marine reserve after the Great Barrier Reef in Australia and the largest in America. Having a place like this on our planet is a rare privilege. This natural resource includes about 3000 species, with 18% of own species. For the explorers of the islands attractions on land are a fascination to see since they had seen a documentary or an article. The images on these options represent our famous Galapagos Islands, but not much is said about the marine reserve. As a result of these articles is that most tourists do not include in their experiences of the marine reserve activities as panga (boat) rides along the coast, whale watching dolphins and whales, bird watching, sea birds, snorkeling, diving snorkeling, kayaking, and walking along the beach and so on. Looking at this reality is understandable the interest to visit the Galapagos for a week minimum. During the time of your stay, you can combine your activities to make your trip unforgettable. Exploring these two protected areas gives us an idea of why the Galapagos Islands is one of the most respected places in the world, where despite of the presence of human flora and fauna is intact up to 95%. There is no sign of other inhabited islands to conduct such a reality. When we submerge under these waters we must remember the respect, the regulation and sharing of explorer focused on preserving this marine resource. That is what we do on earth, is reflected in the water of the islands and ocean currents that determine the biological characteristics of these places, the Galapagos Islands do not have a specific climate throughout the year. This is the tropical destination with greater temperature changes in their water. This physical fact allows species to live in tropical and subtropical regions. In the Galapagos Islands there are subtropical species such as penguins and sea lions that swim with tropical parrot fish. You will enjoy temperatures near 20 * C. The marine reserve has a large percentage of living things on the island. Most facilities offer the tourist the opportunity to enjoy the animal kingdom a service that includes masks, snorkels, fins, floating vest, etc. Some of them even include diving wetsuits to enjoy during the months from June to November the coolest months of the year where the water temperature can be as low as 18 * C. There are activities like going on a boat that has glass in the bottom to enjoy the seafloor mainly for the people who do not dive. For more advanced aquatic explorers, the only way to see the marine reserve is through a diving trip with a tank and their respective characteristics. 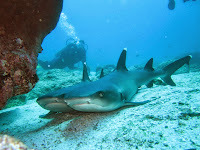 There are two options to dive with tank diving expedition or a day out diving. The Galapagos diving expedition involves exploring the islands from a specialized vessel. The other option is for those who want to combine sports activities with scuba diving, if this is the case; the best option is to stay in a hotel in inhabited islands so you can go nearby dive sites with an instructor on the daily basis. For people who have an interest in diving certificates Galapagos has advanced programs also available. Tourism is a strategic partner for the marine reserve and its conservation because environmental interpretation can educate visitors to respect for marine life and terrestrial life. The exploration of the reserve in the Galapagos Islands reveals the extraordinary experiences of any marine realm. The Galapagos Islands is a marine phenomenon that sustains life on earth. Find your Galapagos Tours.